Discussion in 'iPhone and iPad Games' started by metalcasket, May 18, 2016. 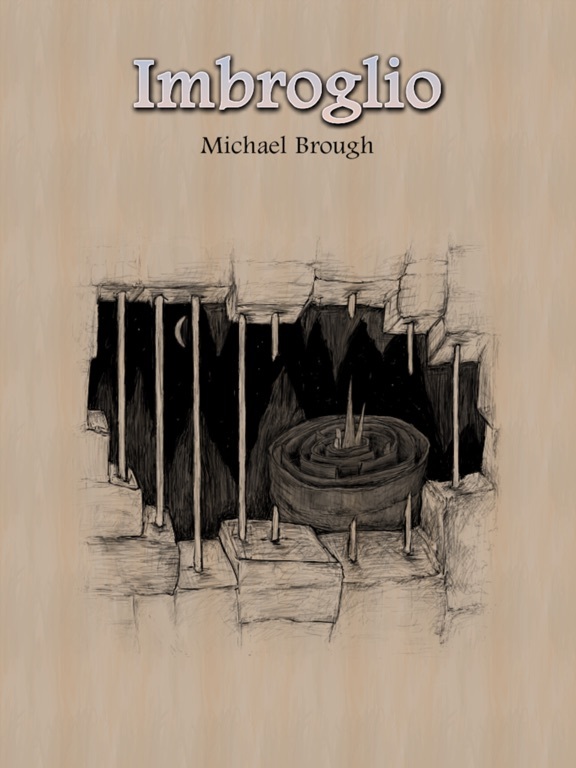 "Every individual element of Imbroglio’s design coalesces into an elegantly complex whole. Nothing is out of place. It’s the kind of game that I just want to think and talk about all the time." - Pocket Tactics review Finalist for Excellence in Design, Independent Games Festival 2017. Named best game of 2016 by iPhone GameCast. Named one of the ten best British games of 2016 by Kotaku UK. Honorable Mention for Best Mobile Game in Game Developers Choice awards 2017. 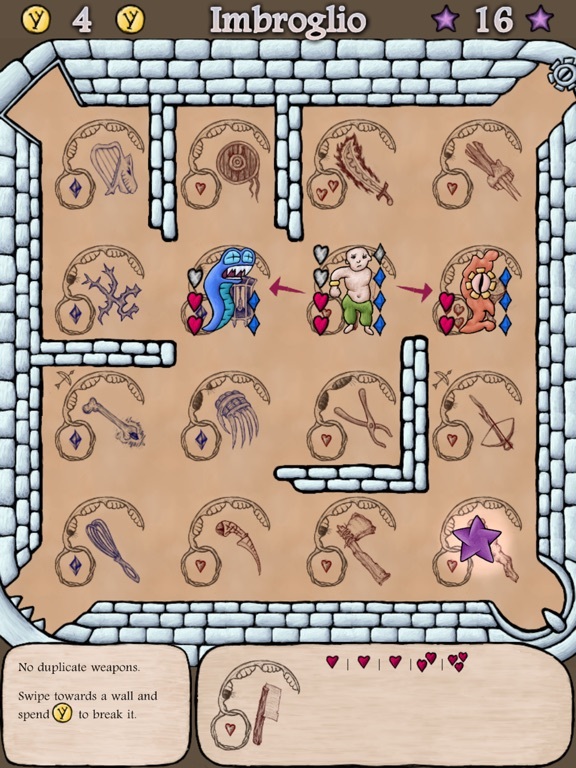 Survive in an ever-shifting labyrinth filled with vicious monsters and valuable gemstones. 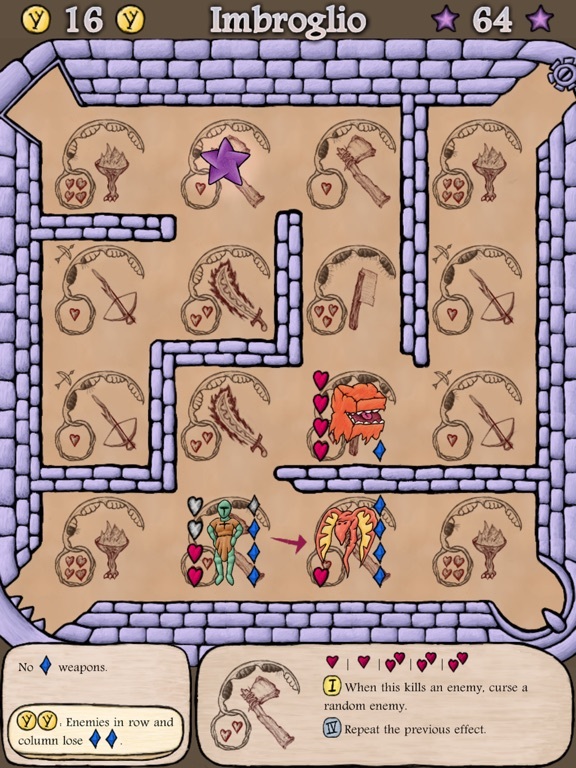 Choose your hero, arm them with magical weapons, spend runes to invoke special powers, and fight for a high score in this deck-building tactics game where the deck is the dungeon. At least four enigmatic enemies to battle. Eight different heroes to play as. Thirty-two weapons to level up. I had high hopes for this game, but the App Store description feels... underwhelming. 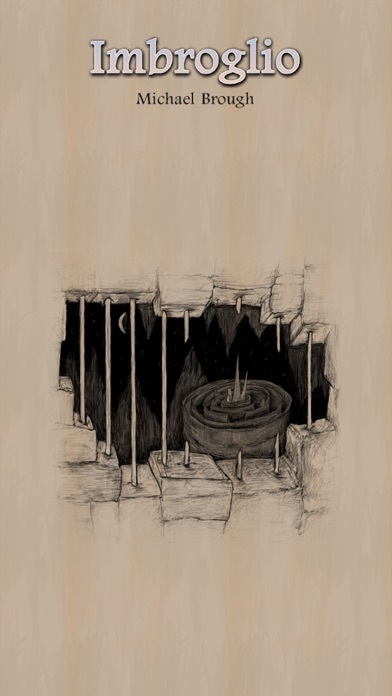 "At least four enigmatic enemies to battle. Eight different heroes to play as, each with their own special ability and a unique challenge to face. Thirty-two weapons to level up." Maybe it's just a phrasing thing - i.e. are thees 4 enemy types, or 4 bosses? Are the levels only one screen? Also, the high-score chasing theme is not necessary my thing - I know quite a few TAers are into that, but I prefer a proper ending in my roguelikes. Still will likely purchase, but will wait for some impressions before doing so. Frankly, this game is awesome. Buy it now. The only description needed is Michael Brough. What makes it awesome ? I hear good things - alas never really played 868 Hack or any of the other game so I'm definitely curious and keen on trying it out! I'm enjoying it so far but must admit it is a weird beast unlike any other game you've likely played. Does anybody understand how character leveling works? It seems very random with no level gained for eons and then I shoot up two levels in just a couple of turns. It can't be based on the toughness of monsters as they remain constant throughout the game (I've yet to see any but the basic 4, not sure if there are more at this point). I love how the weapons themselves level based on how many baddies you kill with them. This also is in no way transferable between same weapons, i.e. 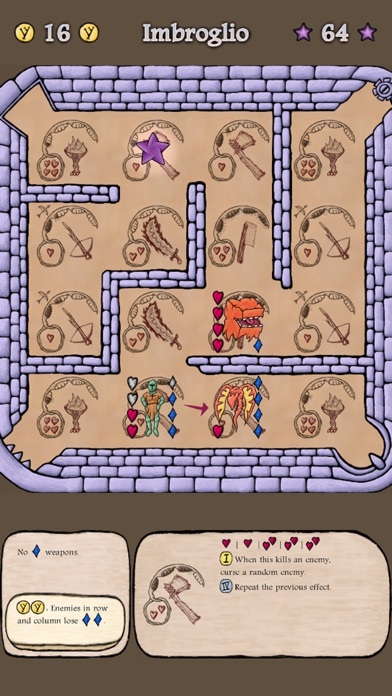 just because you've managed to level up your Vicious Crossbow in the upper left corner doesn't mean another Vicious Crossbow on the grid will grant any special advantages. Oh, I also just learned a big blatant clue, the monster's color coding lets you know what kind of damage they do. Most do physical damage but at least one will do mana damage, and if either stat reaches 0, it's lights out. Another 5 star MB game! I wiped one of the boards with one of the characters whilst fiddling about, and now I can't play with that character as they haven't unlocked board editing yet. Is this some bug, or can anyone help me out here. 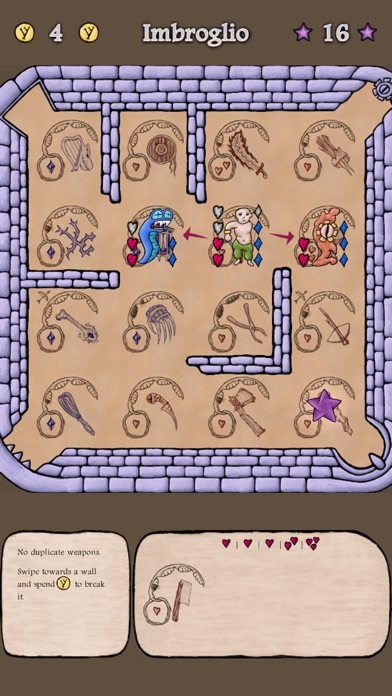 Cool game I'm still trying to take in the mechanics for. Im finding this easier to "get" than his other games, and maybe this will help me play the other games better, LOL! But so far I like it and love the art work. It's a real departure from his usual. sinagog: Bug! If you delete & reinstall that will reset everything, but you probably don't want to lose what else you've unlocked? I'll fix it in an update asap (which is realistically at least a week). Sorry about that; thanks for playing! I've only owned the game for half an hour so I probably haven't lost too much. I'm just psyched to be playing another entry in the Brougherhood of Rogues. Loving what I've played so far. Thanks for getting back to me at lightning speed! Bought. Hopefully I'll have some time to play this in the coming days. Best score 102 so far with the first character. This game really breaks wide open once you start editing your dec--- boards. Those transporting tiles are the most useful ones I've used so far, as they enable you to take on the blue meanies without using any of your own blue dots. Plus if you're low on health, they can get Brough's psychedelic amoeba baddies way the hell away from you. Now to try out those two new characters I just unlocked! It's clever in a Michael Brough sort of way, isn't it? I feel like I'm just getting started. I unlocked board editing with the first character and then went oh, that looks a bit hard and I don't know what I want yet. I'd like to be able to save lots of different boards, in eg "board slots".